Atlanta, GA, January 27, 2010 - On January 23, 2010, SpeedFactory's 426 Charger completed the quarter mile in 9.453 seconds with a trap speed of 145.38 mph at South Georgia Motorsports Park in Valdosta, Georgia. According to records kept by the LXForums.com moderators, SpeedFactory bested all previous quarter mile times set by actual production LX/LC-platform cars. modern Dodge Chargers, Challengers, Magnums and Chrysler 300Cs. SpeedFactory driver Eddie Rosa piloted the Charger. 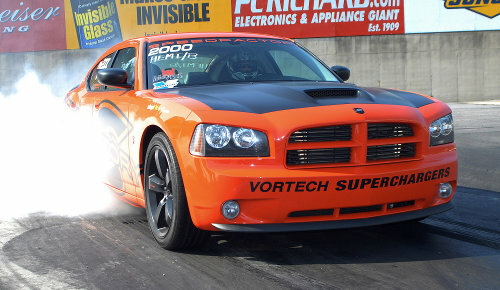 SpeedFactory, in collaboration with partners Landmark Dodge Chrysler Jeep, Vortech Superchargers and Paramount Performance, built this car from a 2006 Dodge Charger platform utilizing a unique combination of heavily modified stock components. The SpeedFactory R&D (Research and Development) Charger is a test platform for high horsepower technology destined to power SpeedFactory.s production vehicles. Based in Atlanta, GA, Speedfactory is a specialty vehicle company focused on unleashing the performance potential of modern Dodge/Chrysler muscle cars. Speedfactory builds enhanced, high-energy modern muscle cars such as Dodge Challengers, Chargers, and Chrysler 300's. Speedfactory offers supercharged and naturally aspirated performance packages with limited powertrain warranties on certain vehicles and configurations. Through select Dodge/Chrysler dealers, Speedfactory sells complete turnkey vehicles and parts and enhances existing cars as well.